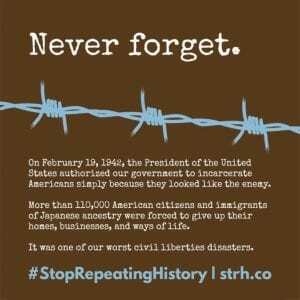 Today marks the 77th Anniversary of President Franklin D. Roosevelt signing Executive Order 9066, authorizing the removal of over 120,000 people of Japanese descent, many of them citizens, from the West Coast. I work in a school district that was once home to a hard-working community of Japanese-American farmers, who transformed the region into beautiful, productive strawberry fields. Following the signing of Executive Order 9066, the history of the Elk Grove-Florin region was abruptly and forever changed. The forced removal and incarceration of over 120,000 citizens marked a chapter in our nation’s history when justice failed an entire group of people. 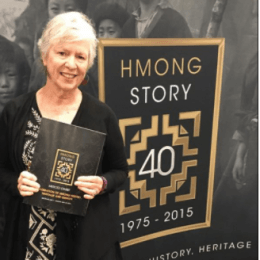 To document their stories, colleague Kathleen Watt and I developed and maintain the Time of Remembrance Oral Histories Project. 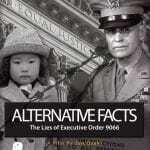 Alternative Facts Social Media Trailer from Jon Osaki on Vimeo. 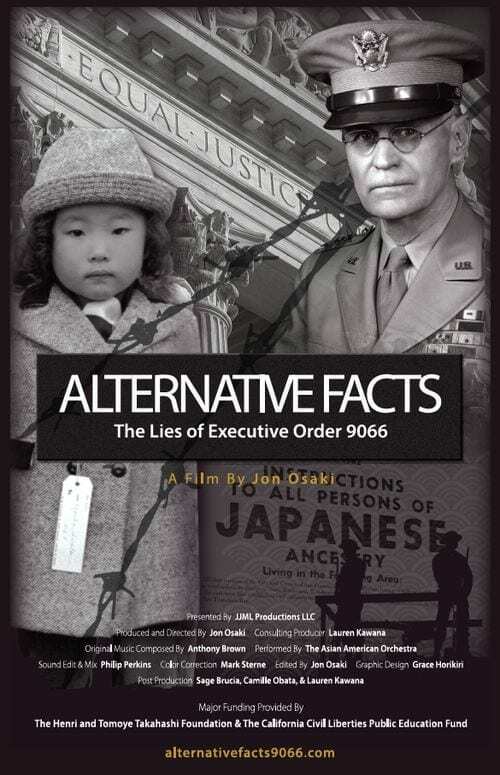 We look forward to an upcoming screening of the Alternative Facts documentary. As always, when new resources surface, we revisit our current lessons and resources to decide where they can best extend teaching and learning on issues of social justice. With much appreciation to my district’s Board of Education for annually recognizing February 19 as a Day of Remembrance: Resolution #42 – Day of Remembrance. 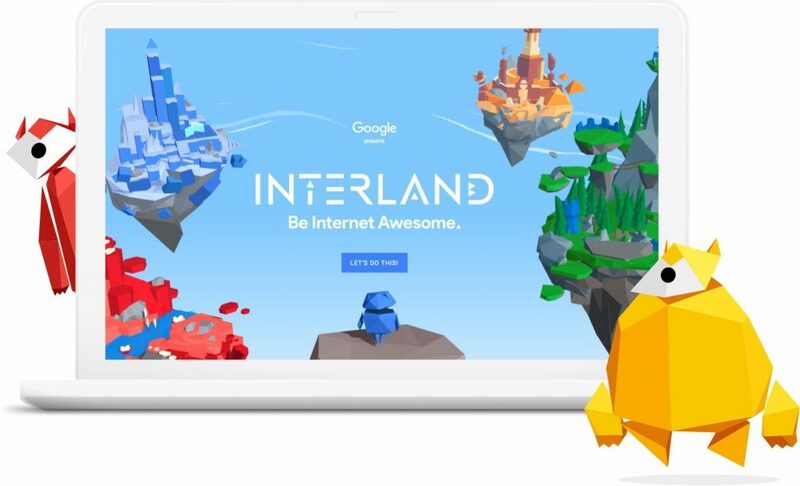 MediaWise is part of the Google News Initiative, funded by Google.org, and aims to teach 1 million teenagers how to spot fake news on the internet by 2020, with at least half of them coming from undeserved or low-income communities. We extend the above invitation to students across the globe. 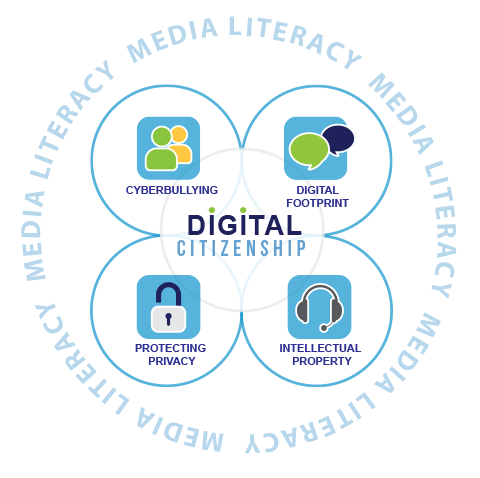 Media Literacy / Digital Citizenship 4 Themes by Elk Grove Unified School District is licensed under a Creative Commons Attribution-NonCommercial-NoDerivatives 4.0 International License. 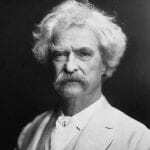 Nope, the above quote is not from Mark Twain, despite being commonly attributed to him … and I admit – until just recently – to being one of the misquoters. For insight on how quotes become misquotes, I recommend Niraj Chokshi’s New York Times article That Wasn’t Mark Twain: How a Misquotation Is Born. Misquotes are just a small slice of an enormous bank of online misinformation (Dictionary.com’s 2018 word of the year). For educators, I think the year has brought a greater awareness that we all need to be media literacy teachers, no matter what grade levels or subject areas we teach. We all need to get into the habit of “putting on our skepticals” (and a few other tips from BrainPop’s Tim and Moby) and recognize when to check if a person really said the words we’re hearing in a video. We all need to be fact checkers, willing to challenge and confront the spread of misinformation. High on my list of 2019 resolutions is a commitment to curate, create and share innovative media literacy resources, best practices, and lessons. I hope you will join me. A highlight of my week was attending the California Department of Education’s first Media & Information Literacy Summit here in Sacramento. Below are my top takeaways from a very full day of excellent keynotes, panel discussions, and a resource fair. 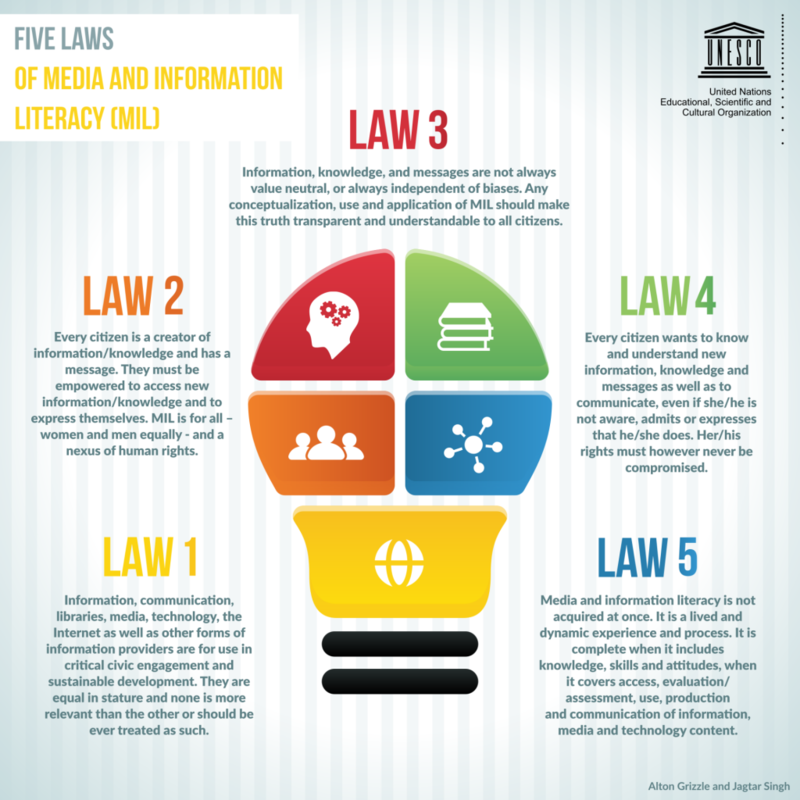 Baird ended his keynote with a reminder that Media/Information Literacy is a basic human right, referencing UNESCO’s Five Laws of Media and Information Literacy in critical times. From the United Nations Educational, Scientific, and Cultural Organization (UNESCO) . For the Love of Learning – Director of Literacies, Outreach, and Libraries Glen Warren, Encinitas Union School District – I’ve met Glen Warren several times in the last few years, thanks to Jane Lofton’s invitations to attend the Librarian’s Dinner at the annual Spring CUE Conference. But until Wednesday’s Summit, I had never heard Glen present. Oh, my, he is an amazing speaker, who combines insights into changes needed in education with a wonderful sense of humor. I love laughing while learning! If you are looking for YouTube examples of satire to include in a Media and Information Literacy unit, Glen shared a few: Blockbuster Offers Glimpse Of Movie Renting Past and New Sony Nose Buds Allow Users to Blast Different Smells into Nostrils. AEIOU graphic from Glen Warren. Luckily for Summit attendees, in the afternoon, Glen stepped on the stage for a second presentation: Curious Skeptics Formulating Questions. Claim, Evidence, Reasoning – it’s the mantra. But how about we start with some good reasoning. Response to Intervention (high brow) – change to Response to Inspiration. We also looked at the UC Davis research on how curiosity helps learning and memory. Bottom line: “If students are allowed to develop their own questions, they are more likely to be engaged in finding the answers.” Such a simple, powerful strategy to teaching and learning – and probably my top takeaway from the summit. P21 Framework – Still relevant, but now embraces the themes under new global awareness framework. Model School Library Standards for CA Public Schools – Will definitely read through these! Global Education Summit Report – Published in 2016, has nine recommendations for California, with a focus on considering multiple perspectives, considering audience, engaging in civil discourse, and ending in a Call to Action! Wait! How did I not know about this report?!? Emily’s work with the California Global Education Project (formerly known as the California International Studies Program) builds on the work I am currently doing with digital citizenship initiatives. I am excited to connect with the CGEP group and learn more about their global citizenship projects. 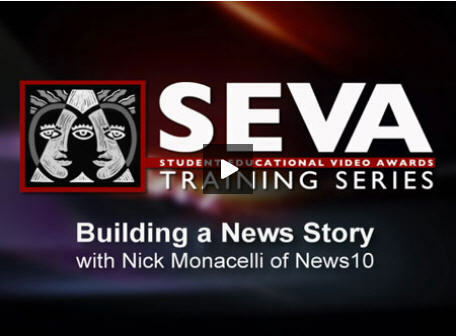 Question: How do we help students work through hyper-partisan media? 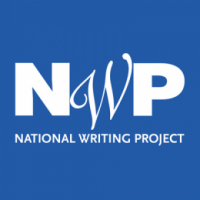 Response: From Chris Nichols – NPR created Politifact California as a response. “Trust, but verify” (even when referring to NPR). Question: How should we be rethinking schools? Responses: Establish a credential program for administrators that includes information literacy. CHANGE CREDENTIALING PROGRAMS! Teaching thinking should be at the top. Capstone projects should be included at every grade level. Embed research across the curriculum – so no kids miss out. Question: How does media/info literacy support student engagement and empowerment? 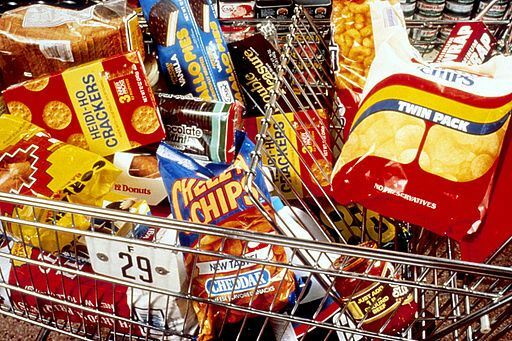 Responses: Media literacy can help bring awareness to a variety of health issues. Kids need to analyze information they’re finding online; they need to be “health literate.” A Health Framework will be released in 2019. Suicide prevention and mental health issues will be included. Check out the Directing Change contest, a venue for kids to create and share Public Service Announcements (PSAs) about critical health topics. Question: How can we help students understand bias in media? Response: Tara Woodall – Have students google a current event (e.g., Colin Kaepernick). How is the same event depicted in different headlines? Here’s where connotation comes into play. Writing shouldn’t be a formula. Ethical use of information, such as following citation rules, happens naturally when students can carry it into their own writing. Tip: Team up writing teachers with statistics teachers. It’s always a treat to join Common Sense’s Sue Thotz (Senior Program Manager, Education) at any event. 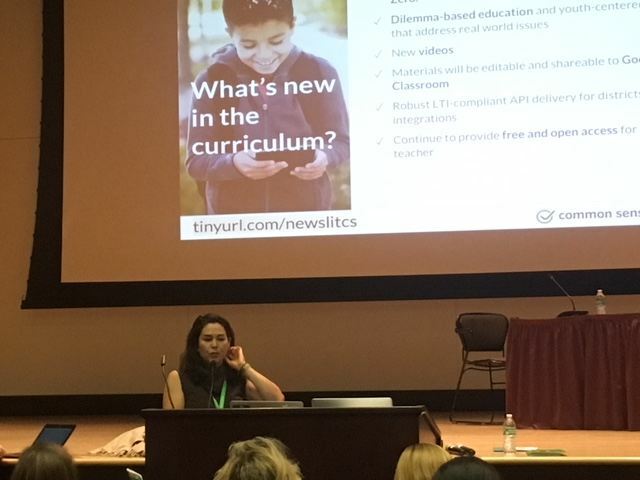 Here’s a link to Sue’s Summit presentation: News and Media Literacy with Common Sense, which is just the tip of the iceberg in terms of the amazing – and free – resources Common Sense provides for teachers, students, and parents on current topics connected to digital citizenship. Deeper Dive (from Go Above the Noise) – Explore and then reflect. 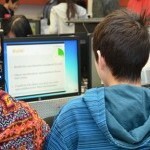 Students are able to share with other students within the KQED community. Although they were not included in the schedule, two representatives from Copyrightandcreativity.org (AKA iKeepSafe) were in the audience and available during the breakout sessions, with a handout that provides a justification for teaching copyright: “In short, because students today are creators and publishers – so they need to understand the basic ground rules around creative work.” Check out the website for an excellent set of lessons, starting with kindergarten through high school, including a set of videos for secondary students. Information Literacy Toolkit – Summit coordinator Jennifer Howerter took the stage again to share CDE’s newly released Media & Info Lit Toolkit: Collaborate in Common, “a free online toolkit filled with resources and current research that teachers, administrators, and parents can use to help support their efforts to advance media and information literacy and the implementation of California’s standards and frameworks.” I definitely plan to spend some time exploring this site and adding to the content. I’m very glad to have had the opportunity to attend the California Department of Education’s first Media and Information Literacy Summit. I appreciate CDE’s recognition that, increasingly, media and information literacy are critical skills in an age of misinformation. In reflecting on the expertise and energy of the speakers and panelists, the introduction to the Model School Library Standards, and the “Curious Septic” theme, start to finish, the Summit was well worth the $20 registration fee (which even included a box lunch). 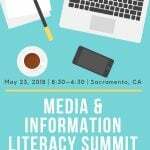 I am already looking forward to attending the 2019 Media and Information Literacy Summit. 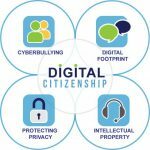 In the eight years I have been co-directing my district’s digital citizenship program, new challenges and new resources have called for regular updates to our Digital Citizenship website, which is organized around four main themes: cyberbullying, digital footprint, intellectual property, online privacy. This school year, in recognition that we are living and teaching in a “post-truth” era, my co-director Kathleen Watt and I been gathering and curating resources to prepare students – and teachers – to deal with the escalating onslaught of fake news and disinformation. It was definitely time to integrate “media literacy” into our digital citizenship program and workshops. 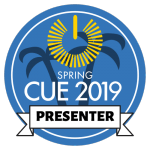 So we were rather surprised – and disturbed – by social media scholar danah boyd’s recent SXSWEDU talk: What Hath We Wrought? We were not expecting her negative views on the value of teaching media literacy, even though she begins with a warning that the content may be provocative. It has been validating to learn that other educators who are passionate about the need to teach media literacy have also found boyd’s message a bit off and are speaking out on where boyd is mistaken. 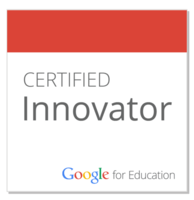 A shout out to the three educators listed below for stepping up to a global microphone. I’ve included a snippet from each of their posts, along with the link, so you can read each post in its entirety, which I highly recommend doing. Each posts succinctly counters boyd’s points. “Oddly, boyd reduces media literacy to a superficial version of fact-checking and describes it as “fundamentally, a form of critical thinking that asks people to doubt what they see.” That makes her “nervous.” It would make me nervous, too – if that was what we actually did. It’s not. “Media literacy education is a pedagogical approach that aims to be continually responsive to the ever-changing media, technology and cultural environment. A visit to the annual National Council of Teachers of English conference would enable boyd to recognize the amazing work of middle school and high school English teachers who explore media literacy through film analysis, analysis of social media, making media with a smartphone, digital storytelling, the study of memes, fandom, reality TV, celebrity culture and more. Media literacy competencies are embedded in the Common Core Standards and they promote academic achievement…. Eight years later, the four themes still remain at the heart of our digital citizenship program. In thinking through a program update, we realized that media literacy was not a separate 5th focus, but rather the overarching framework for digital/global citizenship. Media literacy is the key to unlocking the critical thinking skills needed to confront online bullying, to build and maintain a positive digital footprint, to respect and create/remix intellectual property, and to protect online privacy. 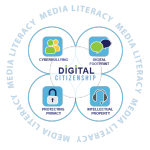 Our Digital Citizenship website now has a Media Literacy page and a new logo. If you have media literacy resources you recommend we add, please leave a comment. 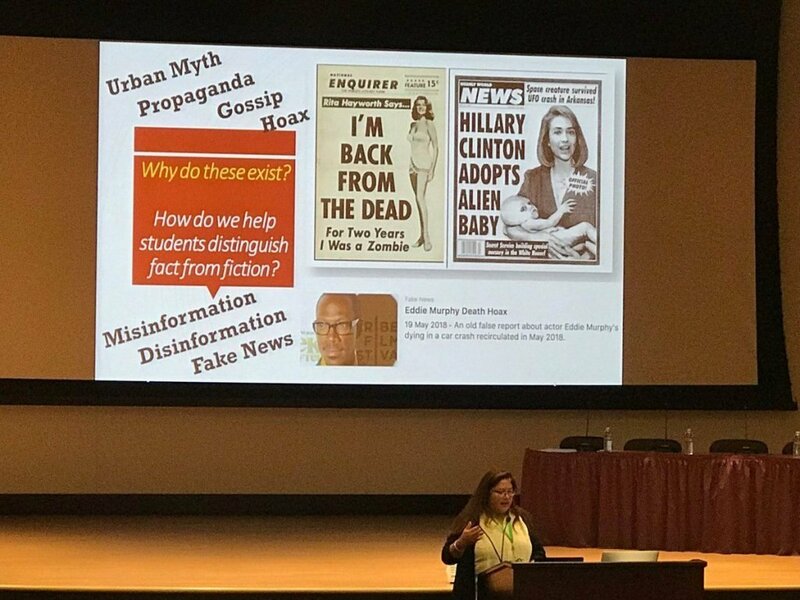 In recognition that we are living in a “post-truth” era, rampant with “fake news,” and that we all need media literacy skills, I’ve been gathering resources, collaborating with colleagues, and creating presentations geared to both students and staff. 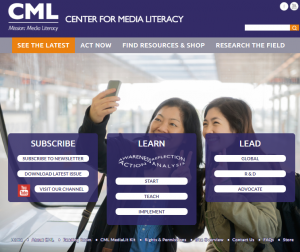 I’m adding to my Media Literacy site almost daily, with a weekly featured resource. 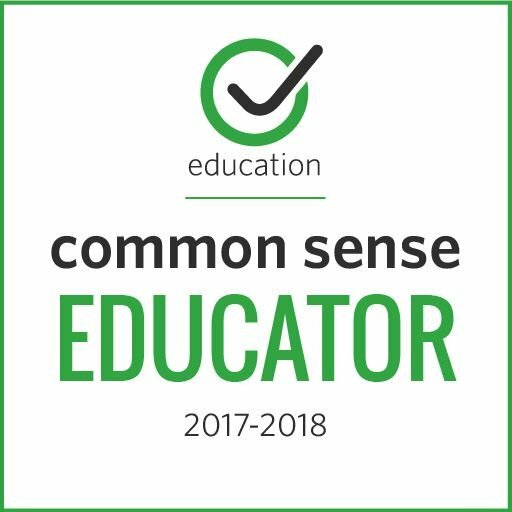 For the past 10 years, I’ve been co-directing my district’s digital citizenship program with my colleague Kathleen Watt. We’ve recently been discussing ideas for merging media literacy into our digital citizenship resources, with possibly a new logo coming soon. A recent article by Keegan Korf, Embracing Our Digital Footprints and Guiding Students to Curate and Reshape Their Own, has us rethinking how we’ve been rolling out our program. Until now, our focus has been solely on students. While we provide a wide range of resources for teachers and parents to use with their students and their children, Keegan’s infographic (below) serves as a timely reminder that we should also be providing resources to help adults be aware of the need to be role models and to build and maintain positive digital footprints. It’s not difficult to find excellent videos for students, such as Netsmartz’ 2 Kinds of Stupid, on how quickly your online reputation can destroy future job opportunities, scholarship options, and more. But what about digital footprint videos for adults? I’m wondering how many talented, young teachers applying for positions in school districts across the nation will not even make it to the first interview due to something they’ve posted on social media. TED Talks such as Megan’s You Posted What?! could help “xennials” or anyone just entering the job market to stop and think before posting, retweeting, etc. I appreciate the stellar work ISTE has done in developing (digital) citizenship standards for educators. Over the next few months, I would like to gather examples of the many ways educators are modeling Standard 3 – with a special focus on 3a. 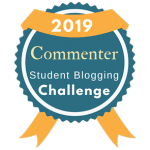 If you have stories, infographics, TED Talks, lessons, articles, etc., to illustrate how an educator is actively making “positive, socially responsible contributions and exhibiting empathetic behavior online that build relationships and community,” please share by leaving a comment. It would be difficult to read a newspaper, listen to a news broadcast, or open any social media site without seeing some reference to “fake news.” NPR NewsHour’s recent interview How online hoaxes and fake news played a role in the election highlights this growing concern. There is definitely a need to bring media literacy into classrooms. 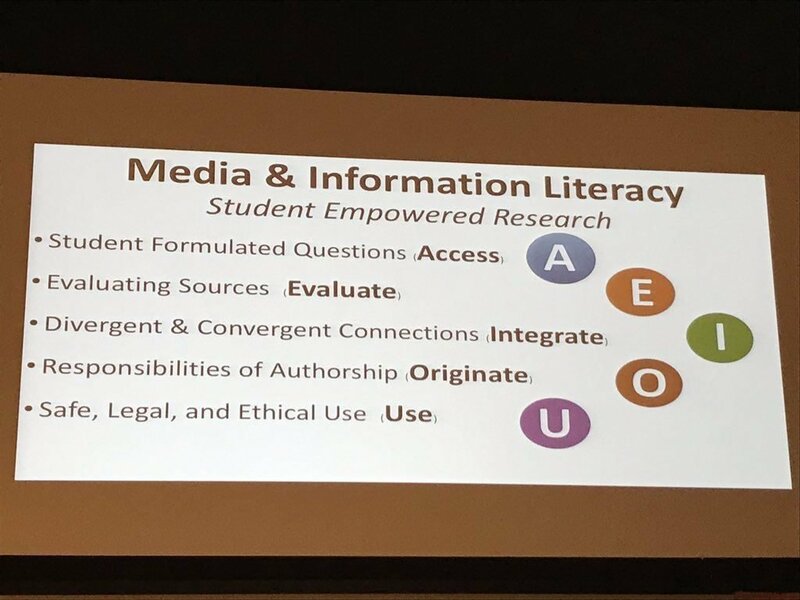 However, since the standards do not come wrapped in a curriculum package, it is up to each district to provide some clarity on what media literacy looks like in our K-12 classrooms. Thankfully, the list of resources for teaching media literacy is growing (see resource list at end of post). I’ve been an advocate for media literacy even before the Common Core. As long-time fans of Renee Hobbs, I’ve been incorporating her research (e.g., Aspen Institute paper) and resources (e.g., Media Education website & downloadable Code of Best Practices in Fair Use for Media Literacy Education) into our digital citizenship and copyright/fair use workshops for many years. But what exactly is “media literacy”? How about some resources for teaching media literacy? 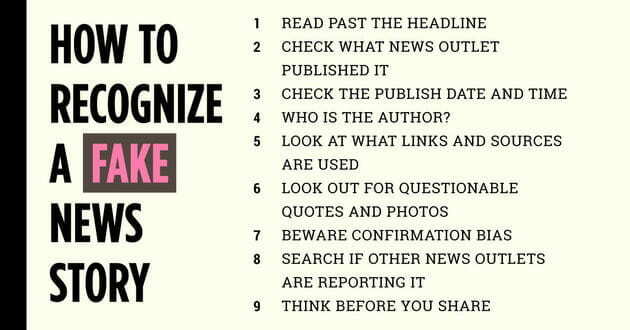 How to Spot Fake News (and Teach Kids to Be Media Savvy) – From Common Sense Media, our go-to site for digital/global citizenship resources. 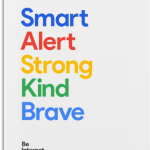 Digital Citizenship – From Cyberwise, here is the link to go directly to Cyberwise’s Media Literacy Hub. Media literacy chart from Huffington post. What’s Going on in This Picture? – From the NYTimes Learning Network, students can explore and discuss weekly images (because media literacy is as much about decoding and questioning images as it is about tackling text). 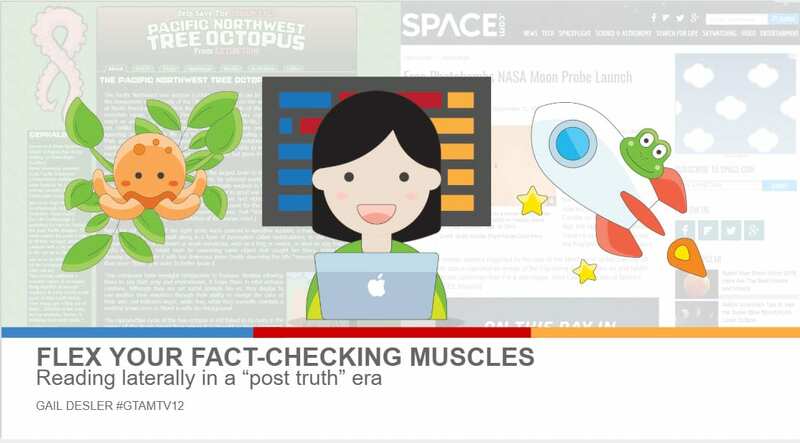 KQED Media Literacy Resources – As long-time promoters of media literacy, KQED’s list is a cross-curriculum resource. Why Teach Media Literacy? – From Newsela, this short post includes links to their media literacy toolkit. 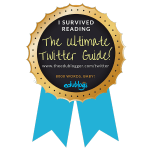 Truth, Truthiness, Triangulation: A new literacy toolkit for a “post-truth” world – I’m ending this list with this extremely timely, comprehensive list from librarian extraordinaire Joyce Valenza. How about some recommended sites for fact checking? I’ll defer again to Joyce Valenza, who includes fact-checking sites under the Resources for building a news literacy toolkit section of her Truth, Truthiness, Triangulation post. I hope these resources will be useful to you and your students, especially following an extremely contentious election year. As always, if you have resources to add or classroom practices to share, please contribute to the conversation by leaving a comment. Many thanks to SECC and cameraman Doug Niva for hosting this wonderful resource.